The draw for the 2017 Tipperary Senior Hurling Championship takes place on Monday next, January 23rd between 7:00 and 8:00 p.m, and will be broadcast live on Tipp FM’s Extra Time show with Ronan Quirke. The Senior Championship, as in previous years, is divided in to Roinn I and Roinn II. Nenagh Éire Óg will this year be entered in to the Roinn I section of the draw, as a third seed. In Roinn I the 16 participating teams are divided into four seeded groups with each club playing all other group members. Following three rounds of games, each group winner qualifies for the county quarter-finals while each group runner-up battles it out with the divisional champions (if not already qualified) in the preliminary quarter-finals. The last placed teams in each group play-off in two games with the individual game losers demoted to Roinn II for 2018. Thirteen teams in all will compete in Roinn II in 2017. There is, however, a significant change to the format of Roinn II for the coming season. The teams, similarly to Roinn I, will be divided into four groups with the group winners and runners-up progressing to the quarter-finals of the Ó Riain Cup. The winner of that round of games qualifies for the semi-finals of the Ó Riain Cup, while both finalists are promoted to Roinn I for 2018. The only way for Roinn II teams to compete for the Dan Breen Cup in 2017 is by winning their respective Divisional Championship, thereby qualifying for a preliminary quarter-final against a second-placed team from a Roinn I group. Each club in Roinn I has been seeded based on their performances in the County Championship last year, the full seedings are as follows. The draw for the North Championship will take place at a later date, usually in the Hibernian Inn, Nenagh. GRMA (Go Raibh Maith Agat) is the new GAA Membership Card programme, providing benefits and rewards to you, as a GAA member. It is a ‘thank you’ or ‘go raibh maith agat’ for your involvement in your GAA club, engagement in GAA activities and attendance at games. Any Éire Óg member who would like more details, or wishes to join the GRMA Programme can get their membership number from Club Secretary Anne Kennedy, on 087-1336024. Club membership is now due. It can be paid to membership secretary Derek Lillis 086-8614863 or any other committee member. you can also join online. We are looking for new people to subscribe to our club weekly lotto draw for the year, costing €100 just €2 per week and you will be entered into 2 free draw’s at the end of the year if you pay the one off payement for the year’s subscription. Or we will collect €50 for the first 6 months and then we will collect the 2nd €50 after 6 months. Please Contact Derek Lillis on 086-8614863 for more information. The committee thanked all the coaches in the club who have given their time freely during the year . The new committee was formed with Catriona Morris as Chairperson , Marie Sheedy Vice Chairperson , Liam McGrath PRO , Liz Duggan Secretary , Séamie Morris PRO , Mark Hassett Child Welfare officer. The committee members are Kieran O Brien , Pat Sheridan, Denise Morris , Tom MacAuliffe , Louise Hickey and Catherine Kennedy . The club thanked two extraordinary committee members who were stepping away , Marie O’Brien who was given a presentation by the club for her incredible work as Treasurer and Enda O Sullivan was wished well in his new Role as PRO for Tipperary football . Both will be missed. Registration Night . The registration night will be February 03 at MacDonagh Park . The senior camogie team will get together within the next fortnight. It is the clubs intention to have two adult teams this year so the club are looking for New Players and Management for all teams from U8 upwards please contact the Chairperson Catriona Morris at 087-7776135 if interested . The club will be setting up a Training fund for the Senior team so that there will be no stone left unturned as they prepare for the upcoming Senior league and championship . If you wish to contribute please contact Séamie Morris at 087-2859125 or any committee member . There will be further announcements regarding funding and sponsorship in the coming weeks. The club will be organising a medal presentation night for the Intermediate team in the coming weeks. The very popular Éire Ógres are back!! Nenagh Éire Óg GAA Camp For Beginners returns for 2017 each Saturday, February 4th to 25th, at the MacDonagh Park complex from 9.45-10.45am for boys and 10.45 to 11.30am for girls. The programme is open to all boys born 2010-2012 and girls born 2007-2012. Perfect for kids of the age to get active after the long winter, improve their hand/eye coordination and agility and make friends in a safe and fun environment. No equipment is needed, just tracksuit and trainers. Tea/coffee/juice/scones will be provided for parents and younger siblings so don’t rush your breakfast. Under-6 Ógres who enjoyed last year’s camp so much are welcome to return to catch up with their friends! The cost is €10 for the month and the kids will be presented with a certificate and a special new design Éire Ógres Training T-shirt on completion of the course. Always very popular so book your space early. Call or text Catherine on 086 0855165 for boys registration and Caitríona on 086-7776135 for girls registration. Call either for more information. The annual Nenagh Éire Óg Juvenile Club flag day takes place in the town on Saturday the 28th of January 2017, and at the various Masses both that evening and Sunday Morning the 29th of January. There are a number of locations that need to be attended throughout the town with the earliest commencing at 9 a.m. It would be greatly appreciated if people could volunteer an hour or two over that weekend at the various stands. Please contact Mel Gleeson at 087-2440855 to let him know availability and any times that would suit. We are always very grateful for your time. 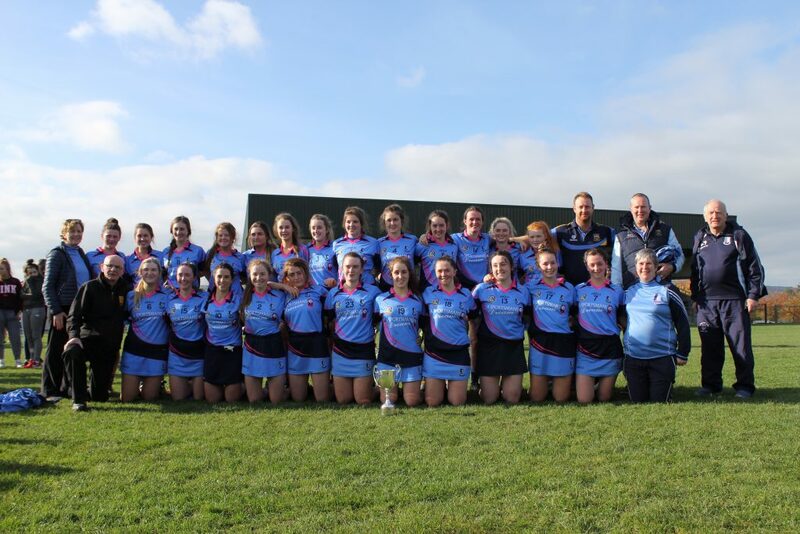 Pictured here, the club’s Intermediate Camogie team & Management of 2016, who won the County Championship securing promotion to Senior level for 2017.